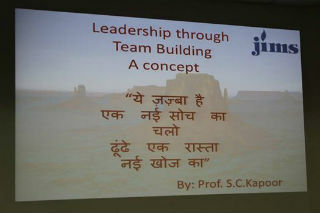 A live workshop “Leadershipthrough team building” was organised on Saturday, 21st February 2015for PGDM-IB students 3rd semester under the mentorship of ProfessorS C Kapoor and his teammate of HR club JIMS. As the topic suggests the spiritof the theme was visible as the IB club JIMS and HR club collaborated togetherto make the event successful as well driven with spirit of concept of teambuilding. The best part of the workshop was total activities were studentscentric right from the planning to execution including the inbuilt of checksand the evaluation process to reach the outcome. The workshop started with theintroduction of the organising team from the HR club comprising of 18 vibrantparticipants with clarity in roles and enthusiasm in action with commitment todeliver result quite pronounced in action. 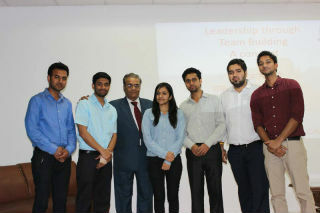 The IB club and students of PGDM-IBwere the participants undergoing complete stages of team building whileexperiencing the feeling and the concept of emerging leadership essential confidenceat the corporate. The workshop started with icebreaking exercise titled “Sweet salt lemon crush and go”. Each participatingteam consisted of 7-8 members with defined resources allocation were to come upwith a concept in terms of a model or a product for the society. The excitementon the face of the students was quite visible during the process and thereafter. 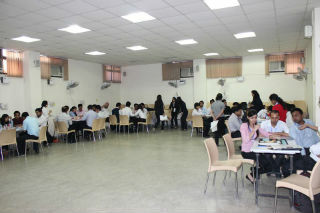 After the grilling activity lasting 100minutes the teams presented the concepts developed for evaluation. The evaluation team examined theperformance on the parameters well explained to the participants before thestart of the event. 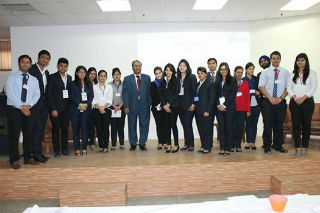 The great experience for thestudents has been to experience live application of the management principleand criticality of leadership role in an organisation making a difference inthe results. The winning team and the runners up were awarded token memento.Overall the participants felt the quality of experience and the live exposureto the hone management skills through such innovative events.